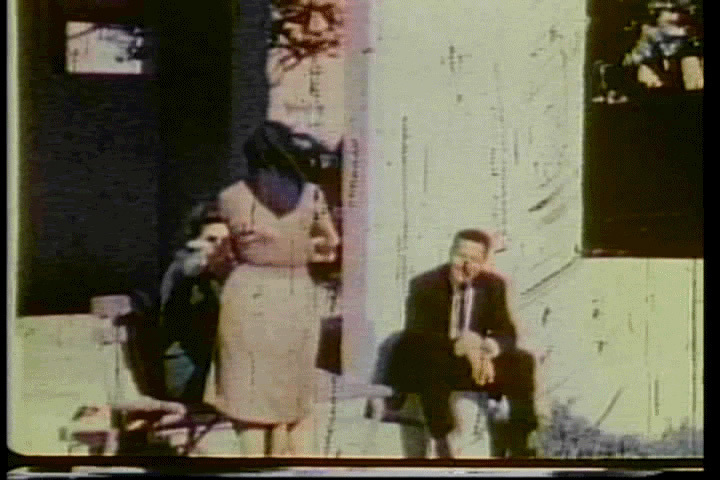 A minute or fifteen before Abraham Zapruder shot the film that would make him famous, he took a second’s worth of footage (well that’s what is available) of the Hesters sitting on the far eastern steps of Bryan Pergola. In the early frames the background at the top right contains what looks like a man. At first I thought he was heap of branches, but I ran him through Mark Turner’s sketchup model of Dealey Plaza anyway. He could have been any passerby, but I took a closer look. The man in the background is set well back. Apart from facial features, the colours in the area are different – greys and skin tones. He is close to a car parked behind the shelter, and there are thing obscuring part of his face and his lower body. I have placed Bryce, the default sketchup guy, at various depths to try to see if mystery man is the right height to be a man at all. It starts to work when he’s placed off the kerb a few steps back into the street. For mystery man’s head to be at that height, he’s either quite short (1.6m) or he is bent down a little. The cardboard-coloured “packages” could be branches, but there is no tree right there (one is slightly to the left), and the Yapoun trees don’t have enough girth to match. 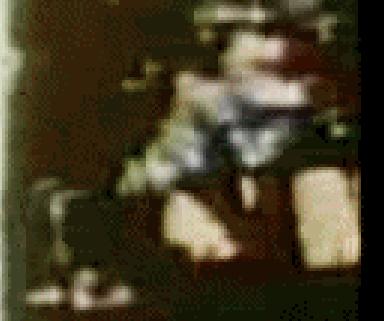 The man is moving slightly for the few frames we’re able to see him. He could be wearing a light coloured shirt and possibly overalls or a vest. He may have his right arm in front of his face. Thinking of short people, I recalled Chauncey Holt’s 1991 confession (it’s long, so search “pickup”). He was apparently 5’4”, and had a forehead and hairline that seem to match – especially the widow’s peak. Holt said he dropped documents (including fake IDs) into a pickup in the parking lot, close to the tower. Contemporary pictures of him can be found here. I wouldn’t stake money on it being Holt, but found it an interesting resemblance. Thoughts?